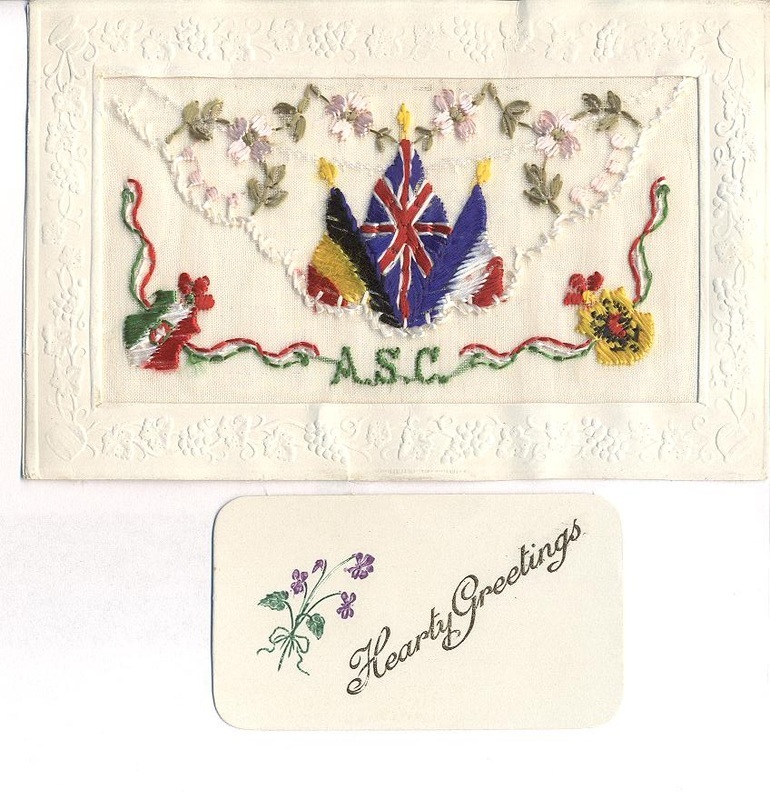 The Stirling Council Archives collection includes an album containing postcards sent by First World War soldiers and collected by the Whinwell Children’s Home in Stirling. 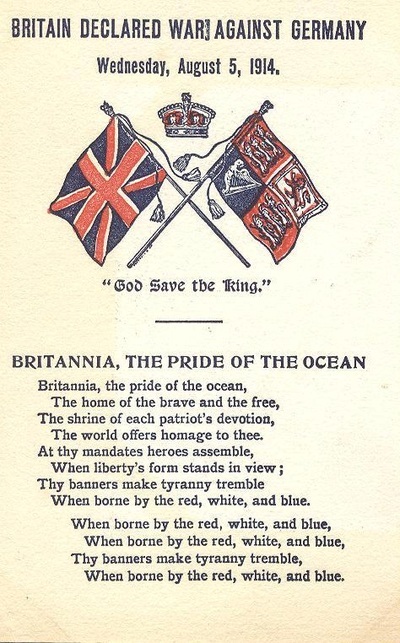 As can be seen in the examples below the cards vary in mood from displays of patriotism to real-life scenes of towns destroyed by war. This month marks the 100th anniversary of Britain’s declaration of war on Germany in 1914. Shown below is a postcard issued at the time of the declaration and which is clearly trying to rouse a feeling of patriotism with its use of the Union Jack, Royal Standard and verse from ‘Britannia’. Beautifully embroidered postcards, known as ‘silks’, were extremely popular with British and American soldiers who would have bought these to send to their loved ones back home. Most often they were made from strips of silk mesh hand embroidered by French or Belgian women refugees. The card shown below has a flap cut into the silk, like an envelope, to allow the miniature greeting card to be placed inside. In contrast to the other postcards shown here, several within the collection show scenes in France and Belgium of towns that have been destroyed by the battles that took place on the Western Front. 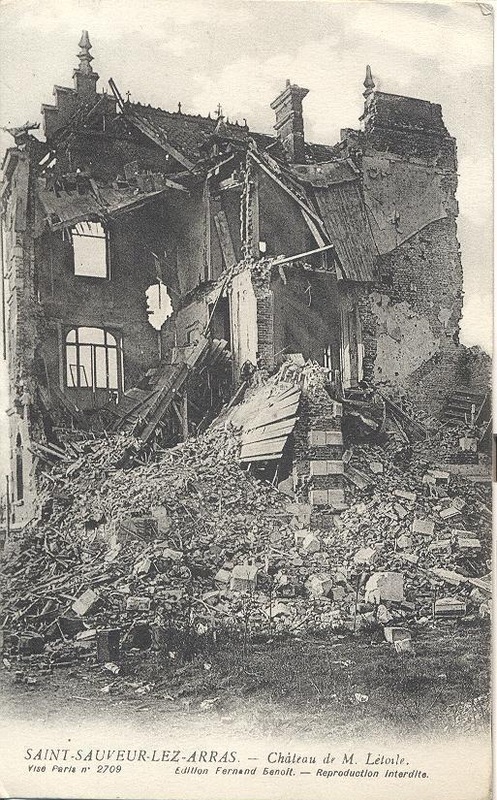 The postcard below shows a scene from Arras, a city less than 7 miles from the front line in northern France and which was a victim of numerous battles during the war.